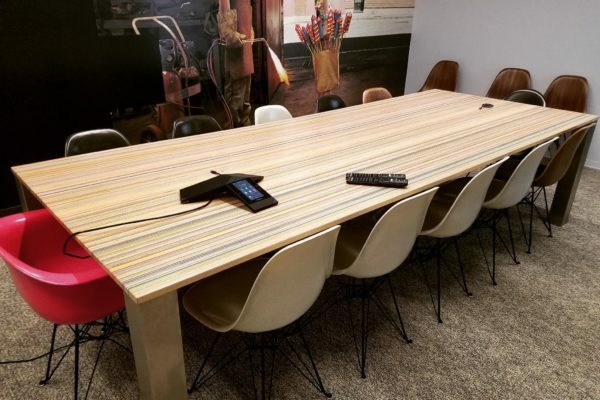 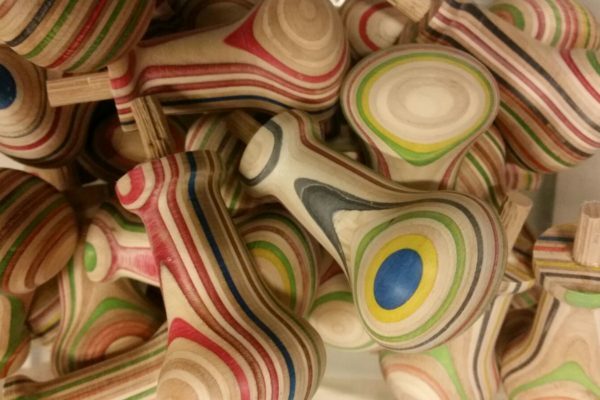 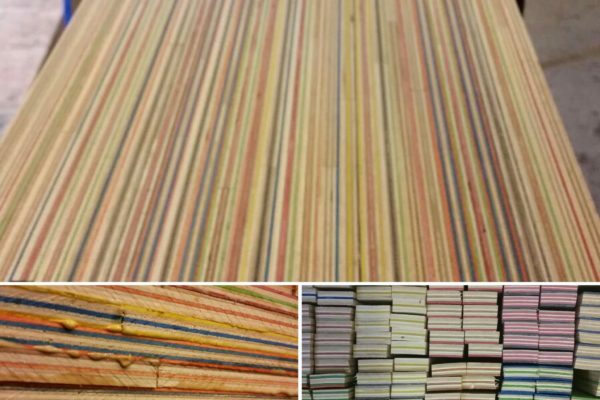 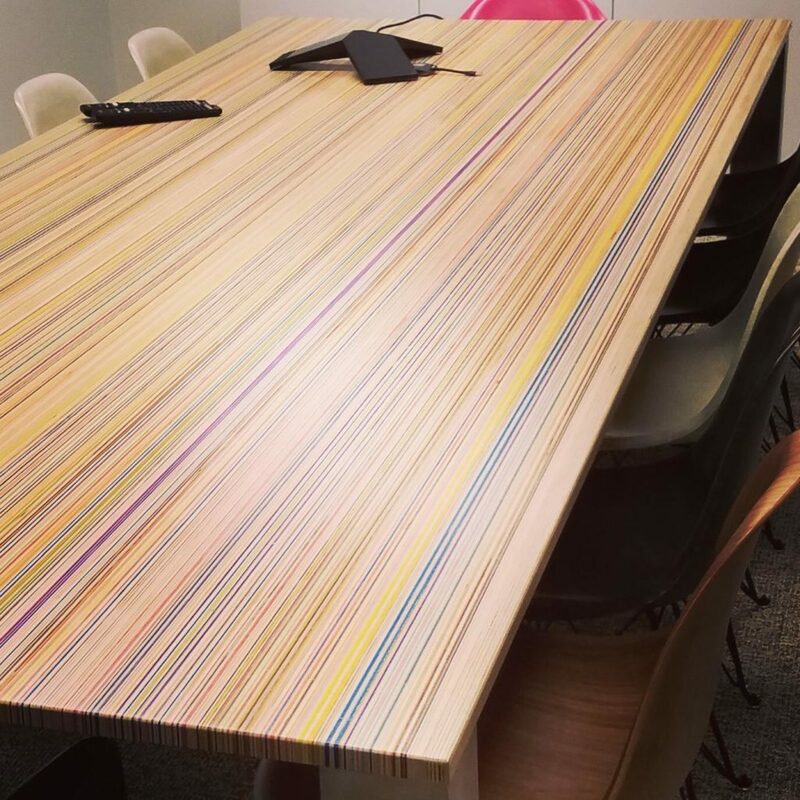 Focused Skateboard Woodworks offers custom solutions for architects and interior designers. 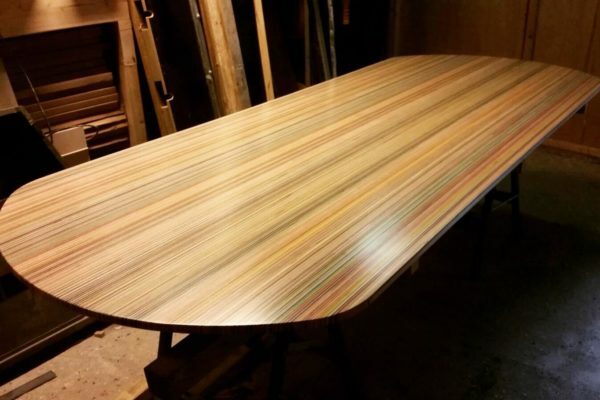 Here’s an overview of recently finished projects. 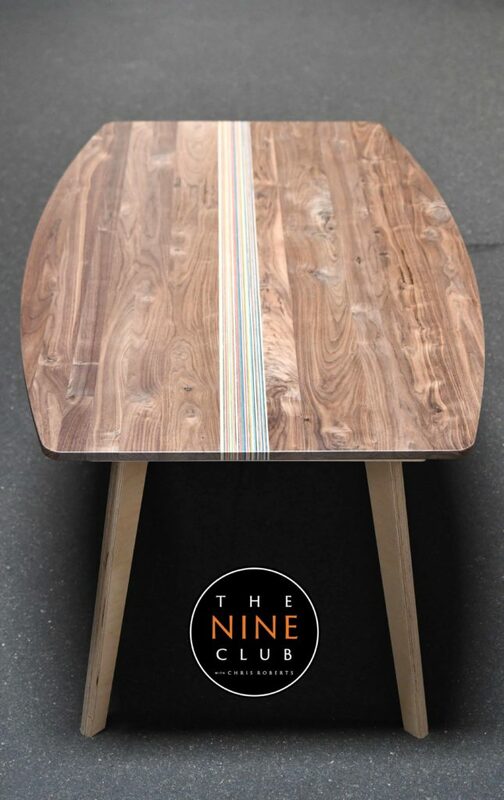 The table was introduced during The Nine Club Experience Episode 44. 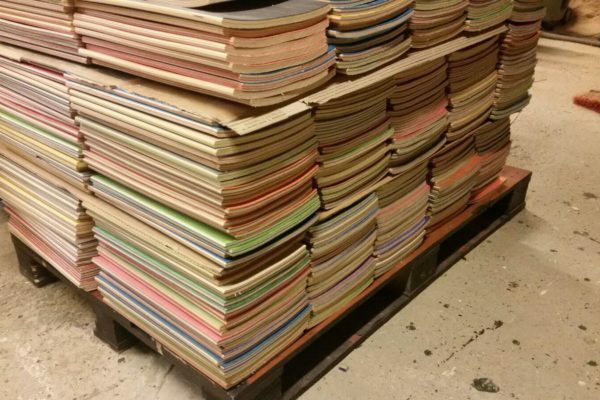 The video of the skaters donating their boards was filmed and edited by Jan Maarten Sneep. 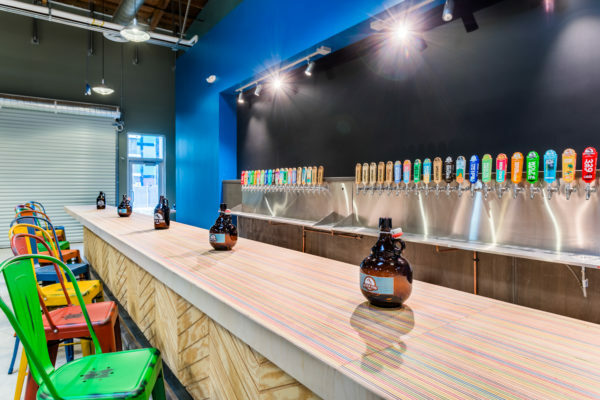 In collaboration with Scott Edwards Architecture (Portland USA) we constructed a 12 meter long DecksTop bartop for Golden Road Brewing (Los Angeles USA). 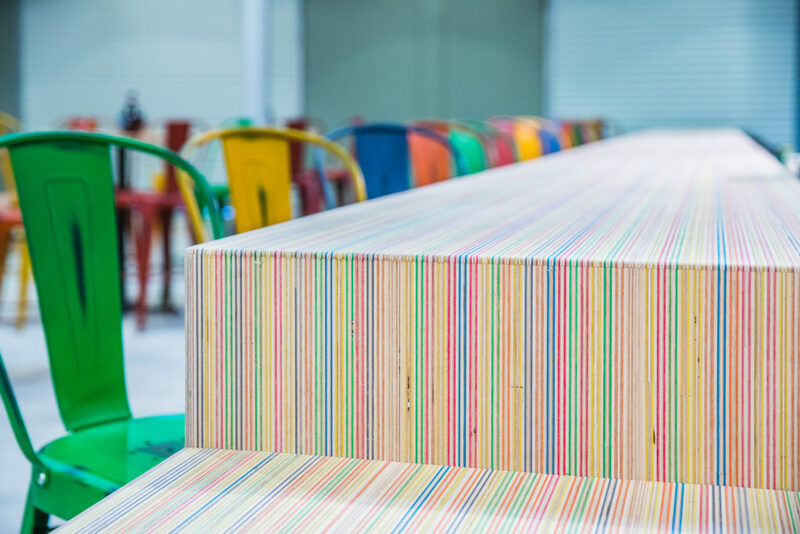 The bartop was constructed from over 400 recycled skateboards and is now located at the new Golden Road Pub in Anaheim right across the Angels stadium. 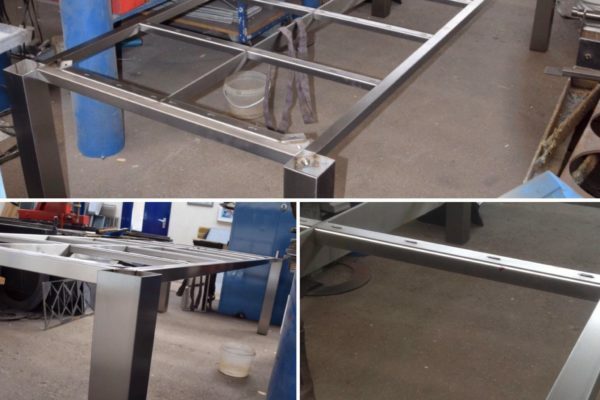 A special feauture of the bartop is the rainnbow waterfall drop to the lower bar segment. 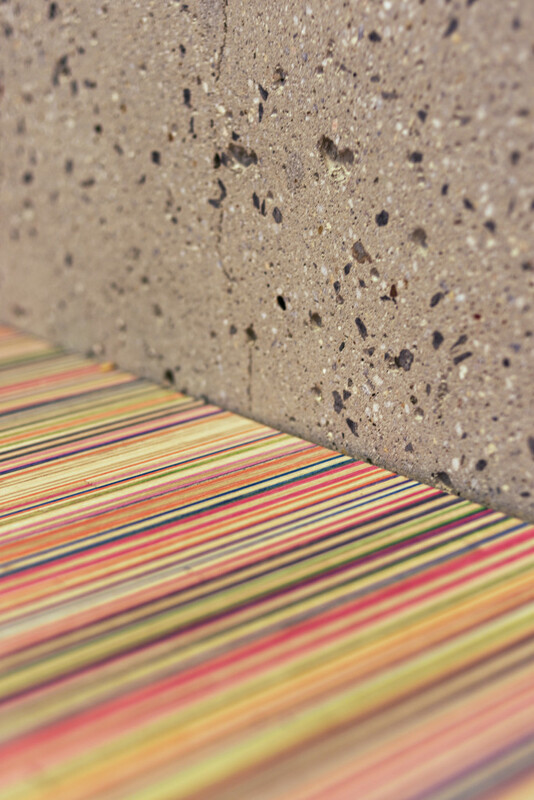 This project was feautured in Los Angeles Times and The Orange County Register. 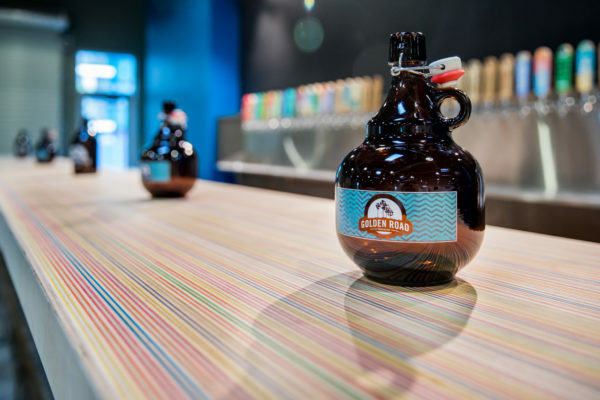 Photo’s on the courtesy of Golden Road Brewing. 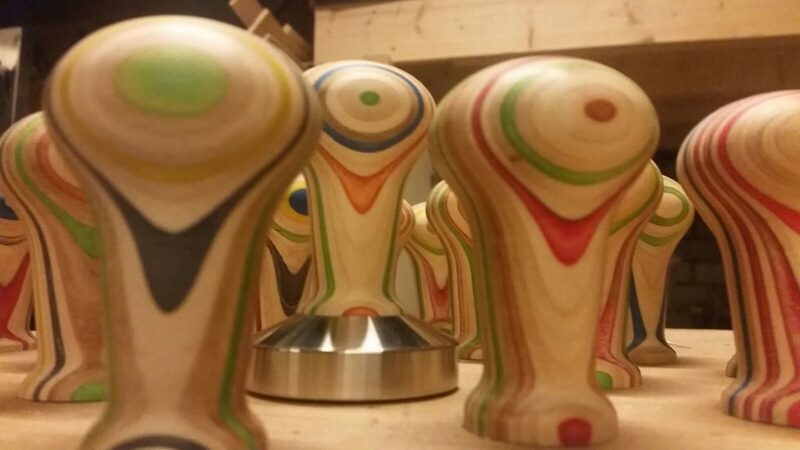 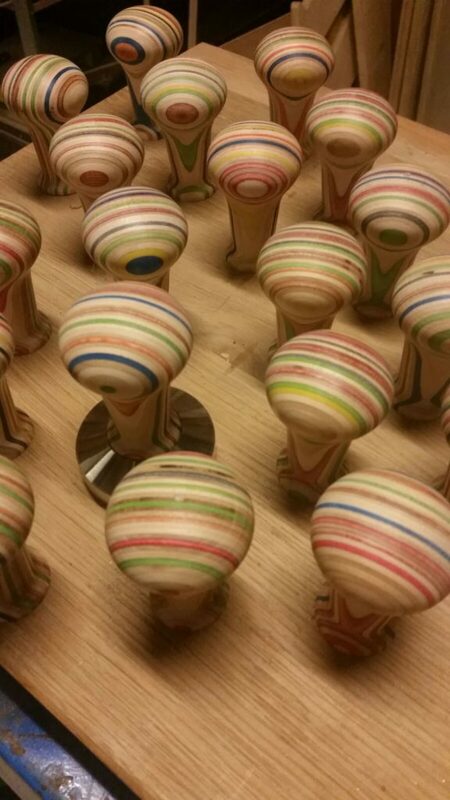 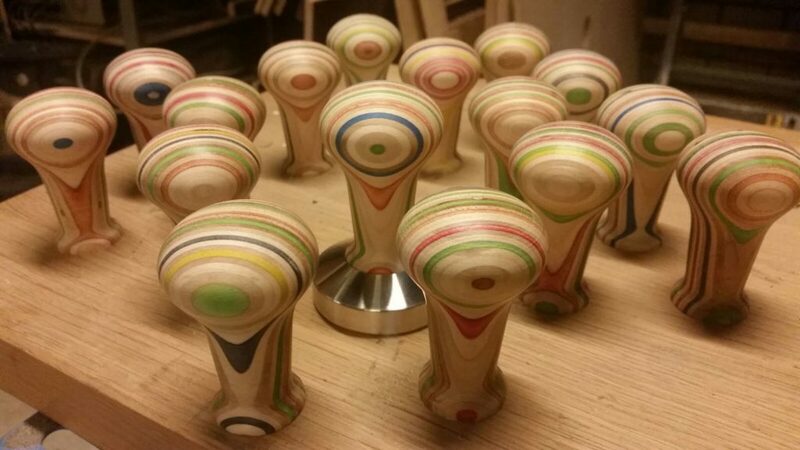 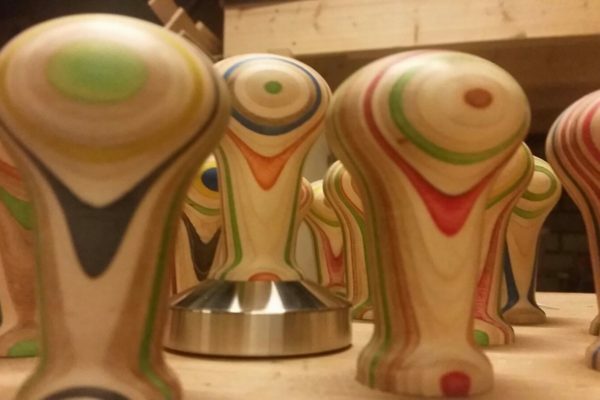 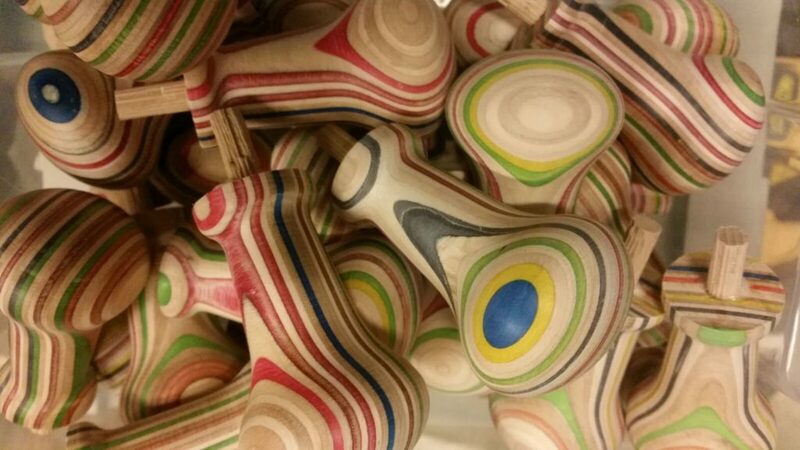 In collaboration with Stielman Koffiebranders we developed 25 limited edition coffee tampers, made from recycled skateboards. 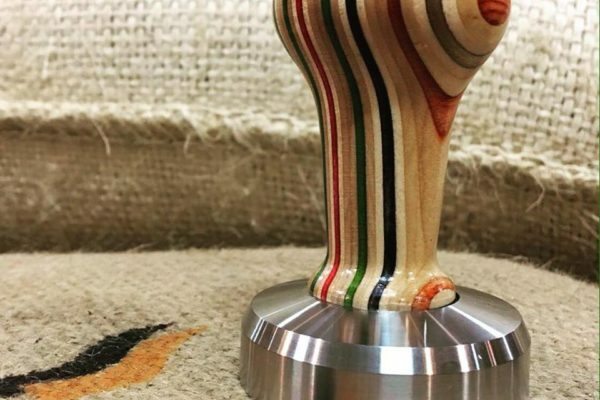 The perfect gift for all those rolling barista’s out there. 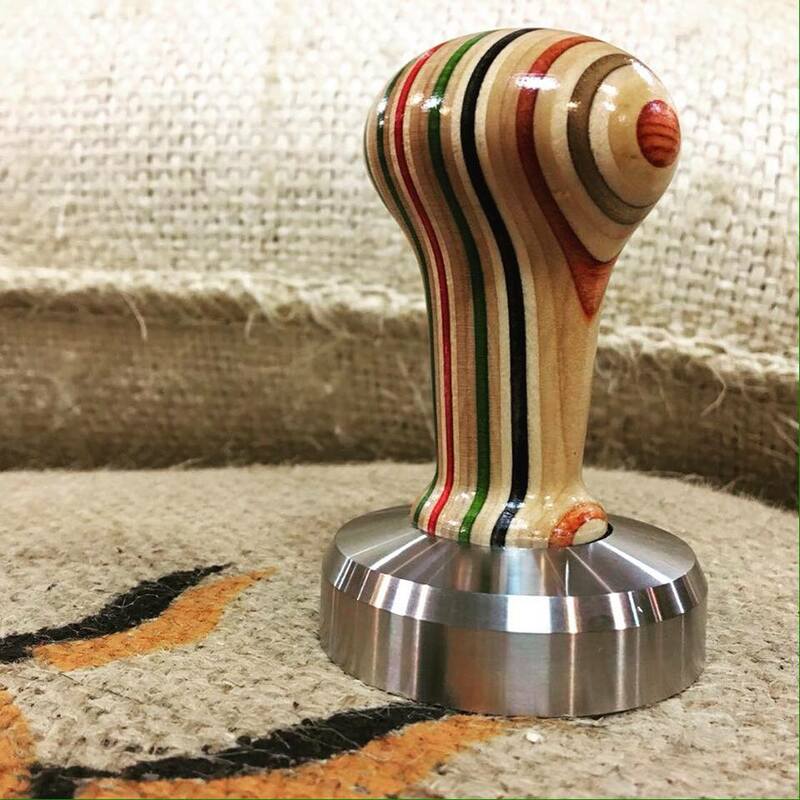 The tamper is equipped with a 58.5 mm stainless steel base for a perfect fit in a portafilter. 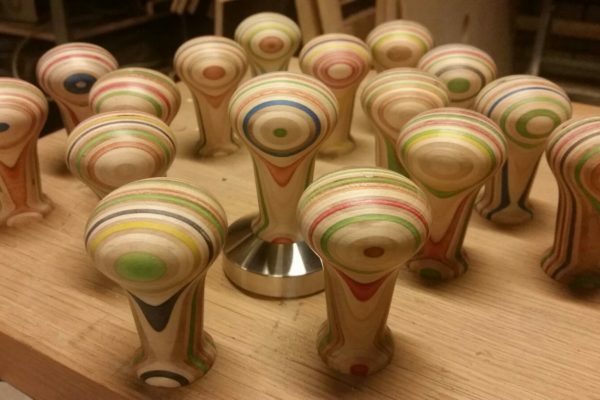 With this unique coffee tamper you will not only be making good coffee, but also look good making it. 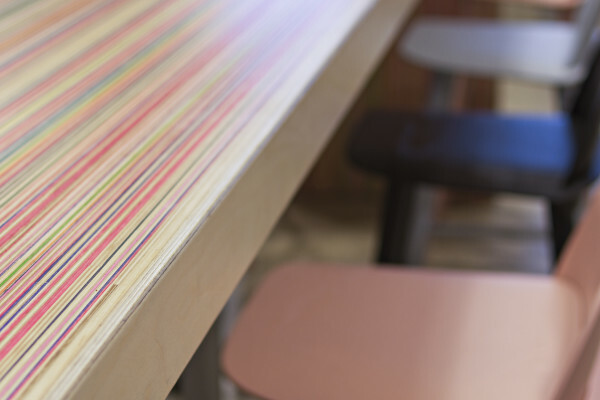 Stielman Koffiebranders is a local coffee brand, well known for their high quality and durable coffee. It is based in the popular Fenix Food Factory in Rotterdam. 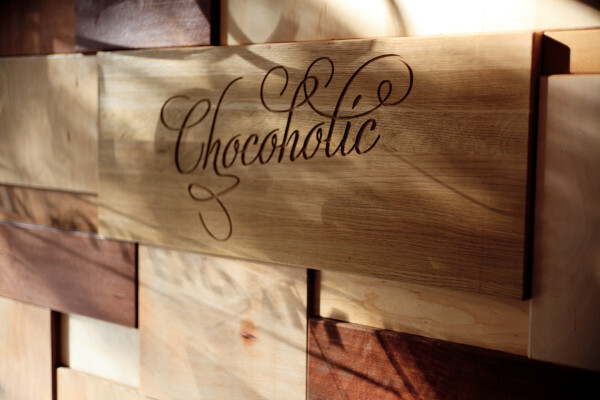 A place where entrepreneurs display their craftsmanship, offering the best locally crafted foods and drinks. 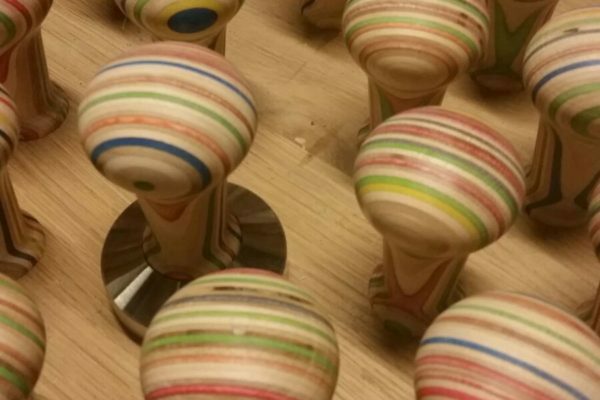 The tamper is available at the Stielman Koffiebranders online store. 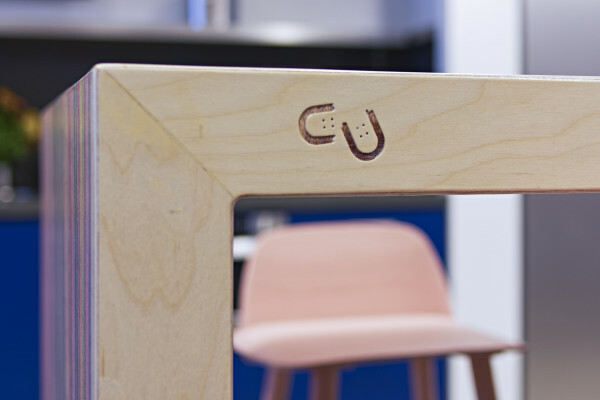 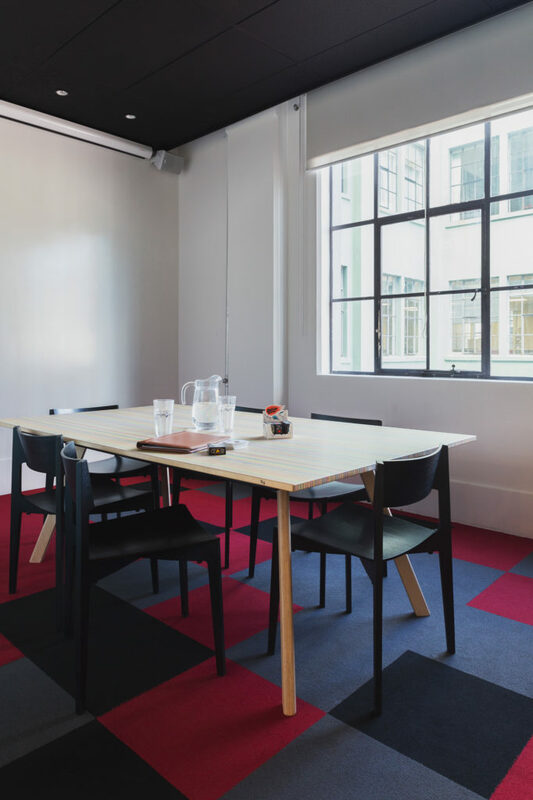 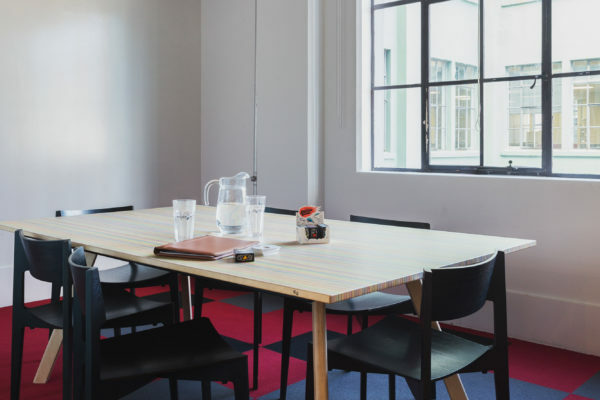 In collaboration with Charlotte Minty Interior Design we designed three custum tables for Chrometoaster in New Zealand. Chrometoaster is an independent, award-winning digital design and open-source development agency based in Wellington, New Zealand. 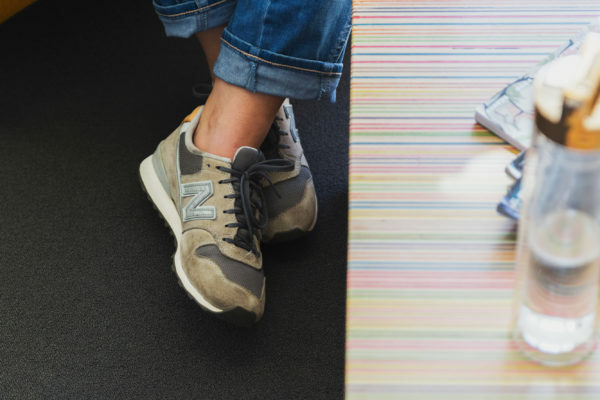 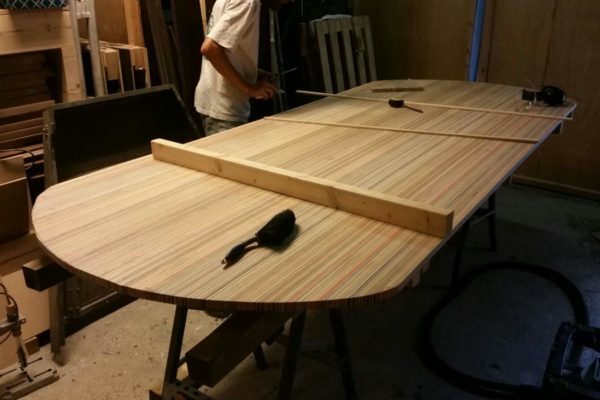 A special feauture are the DecksPad twins with identitacal color patterns. 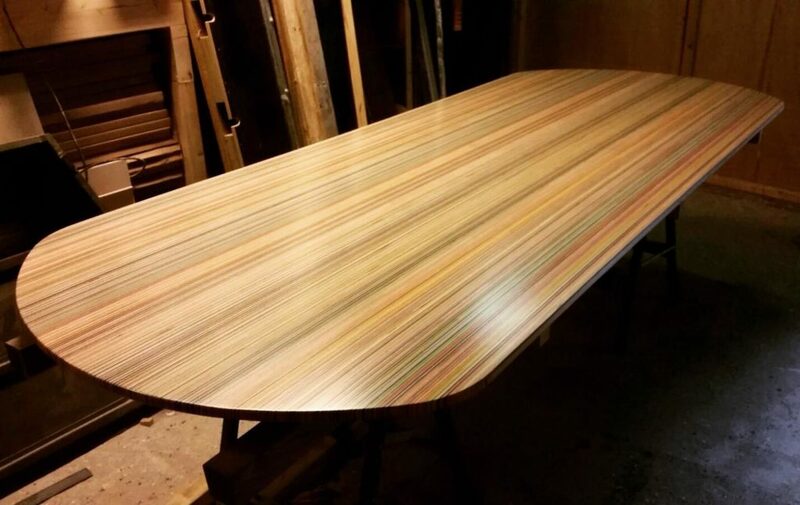 The third table was a custom sized DecksTop Timber. 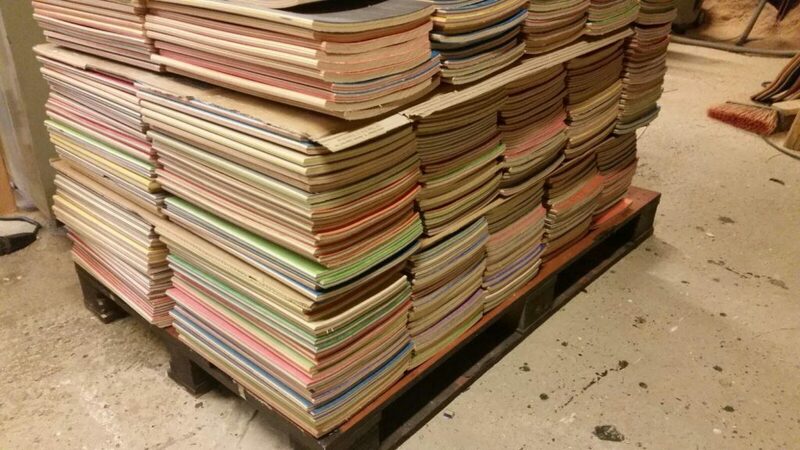 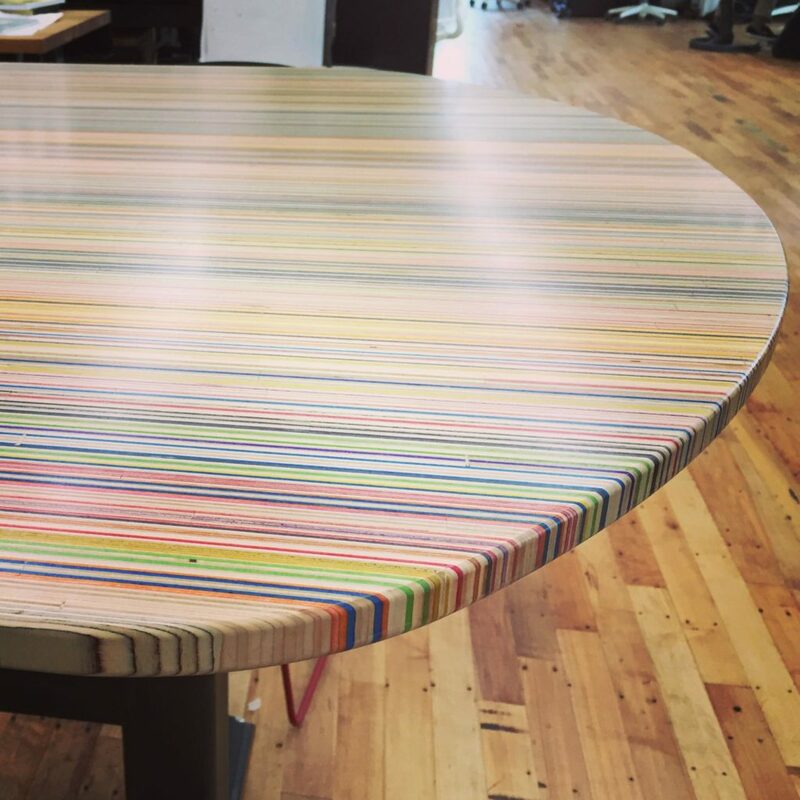 A total of 335 skateboards were recycled for these three tables. 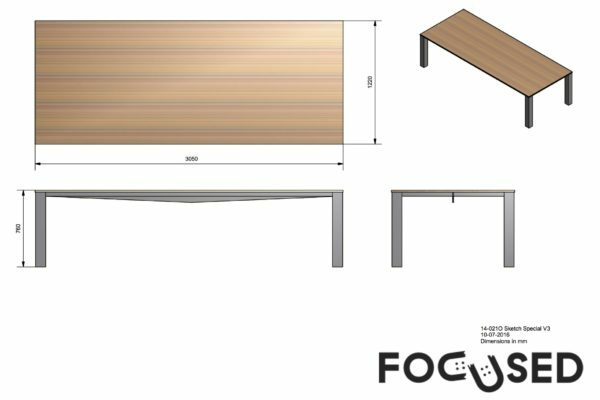 In collaboration with Ted Moudis Associates and Workwell Partners we constructed a large DecksTop table for advertising agency Media Assembly in New York City. 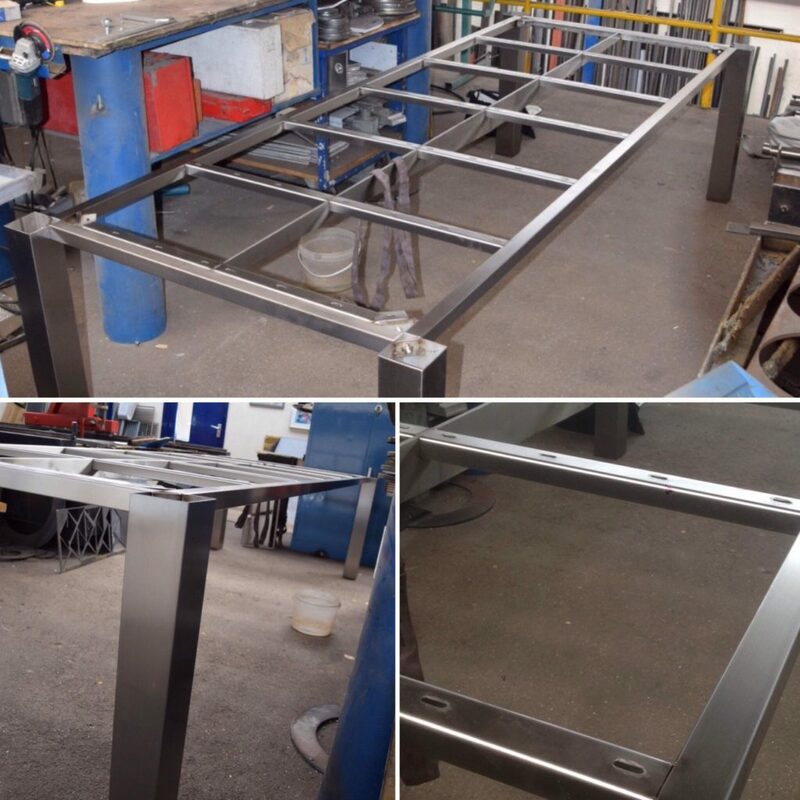 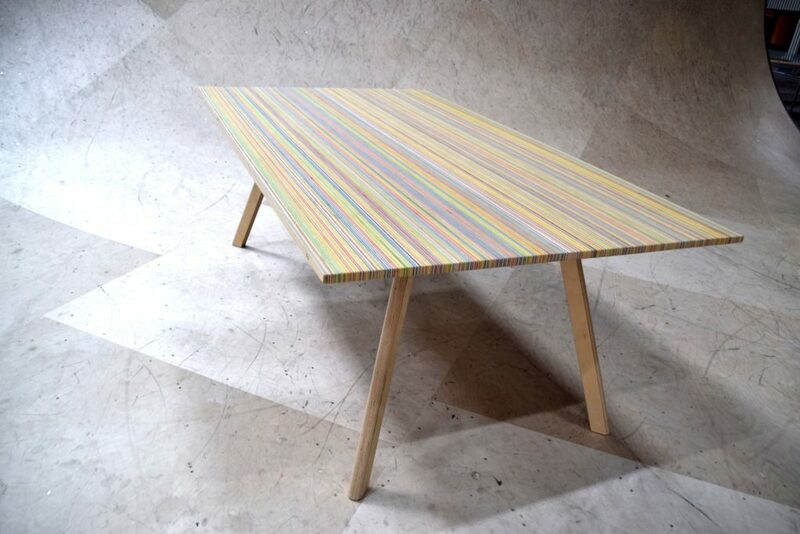 This table is over 3 meters long and 1,2 meter wide. 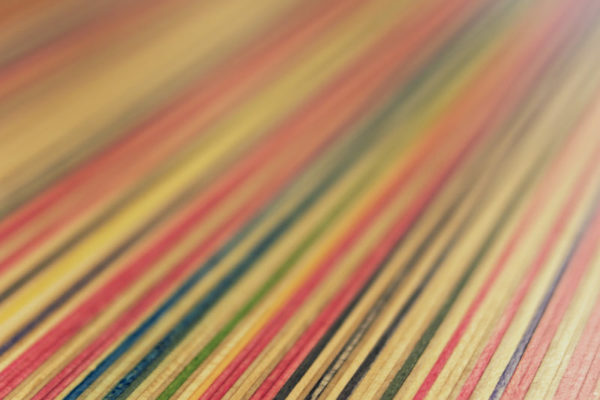 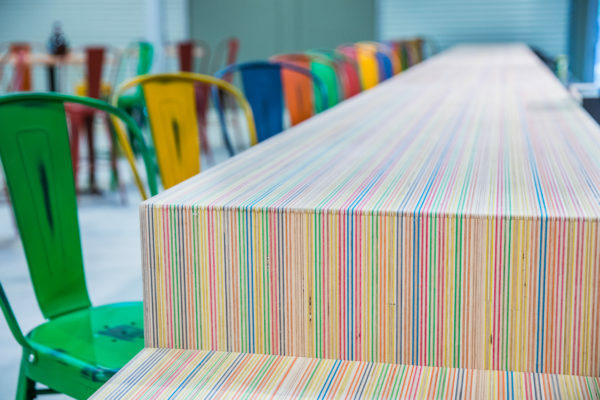 It was constructed from 240 recycled skateboards. The colorfull tabletop rests on a stainless steel frame which was also designed and produced by Focused. 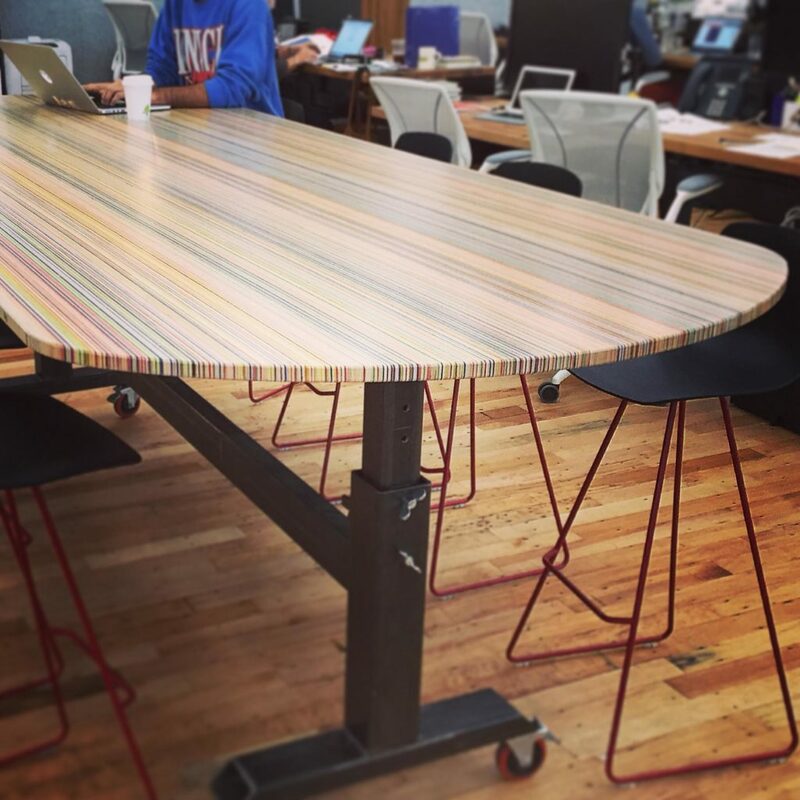 In collaboration with Situ Studio New York we constructed a custom DecksTop table top for a large tech company in New York. 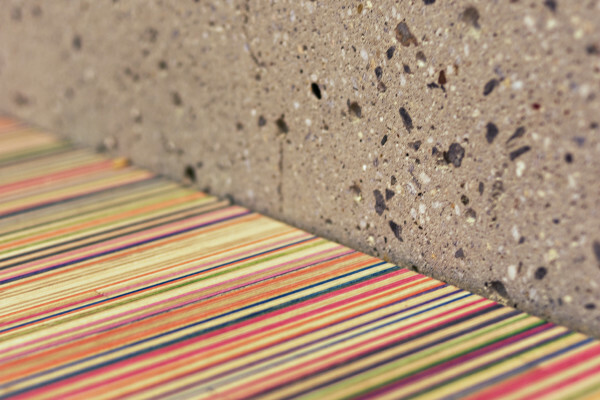 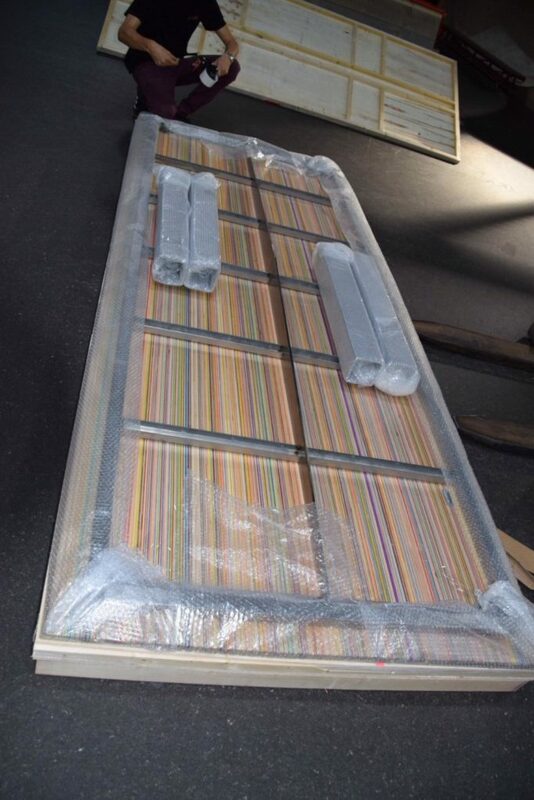 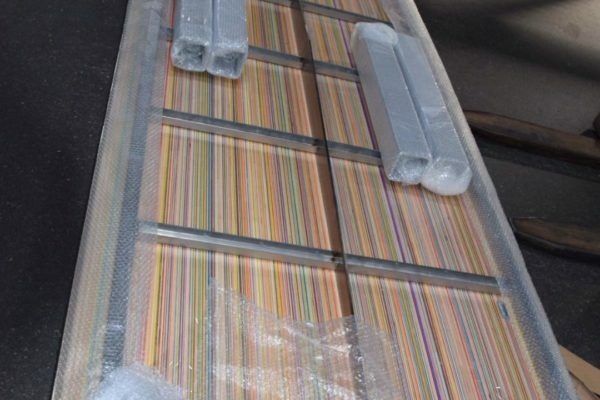 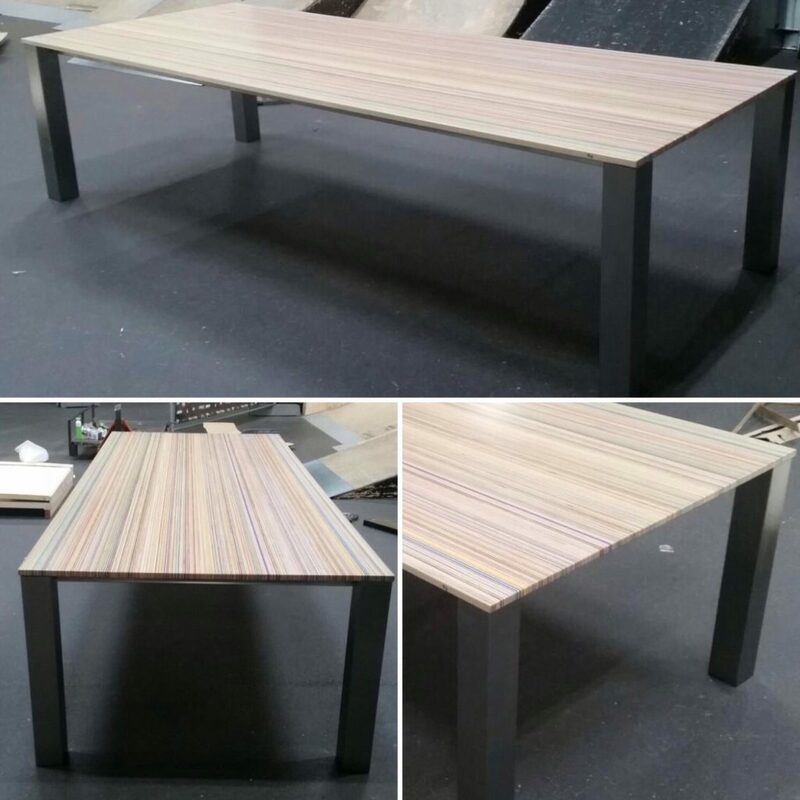 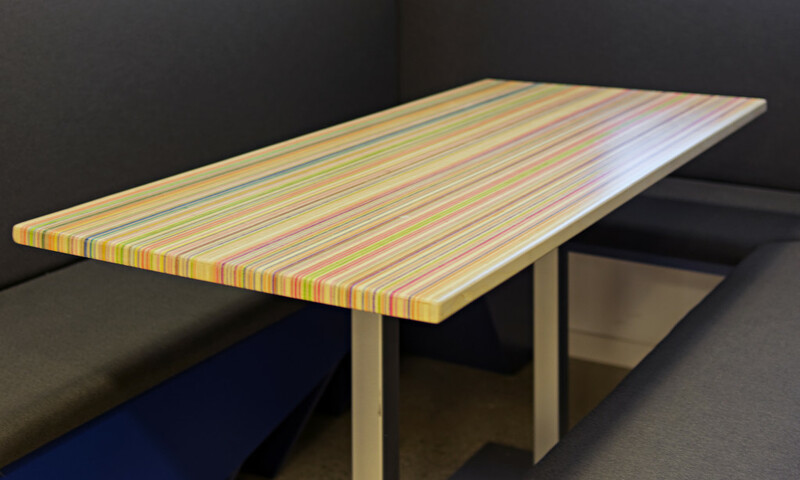 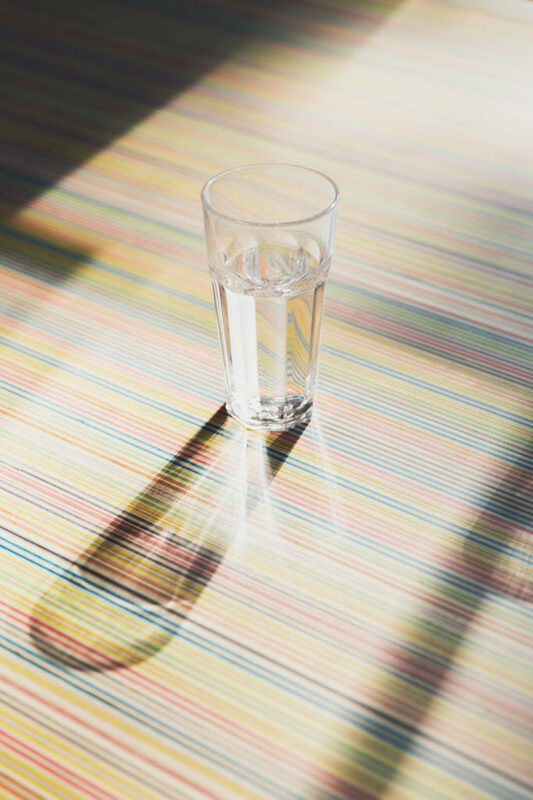 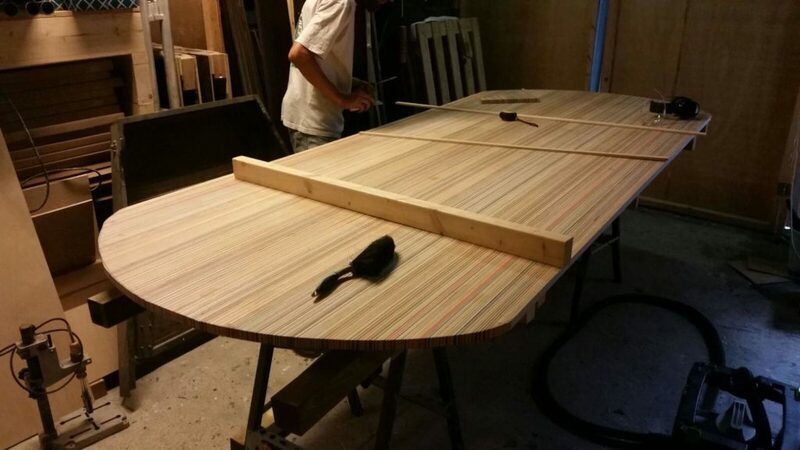 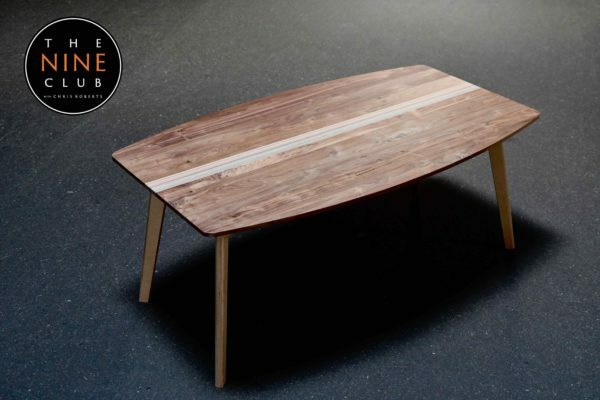 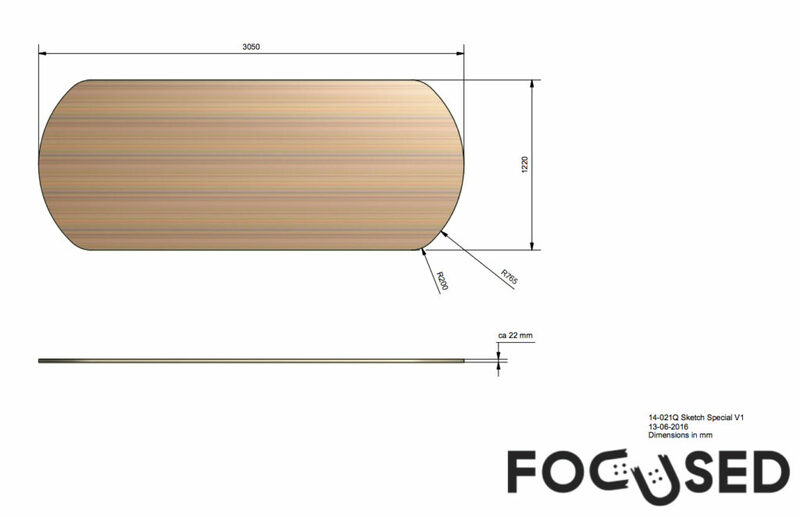 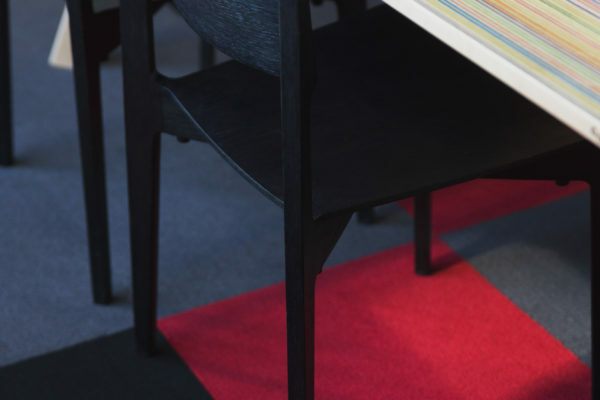 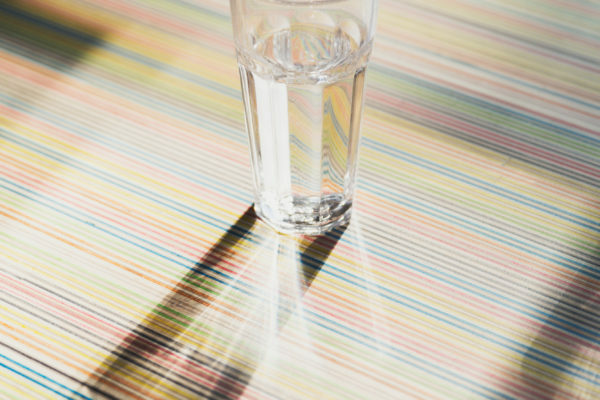 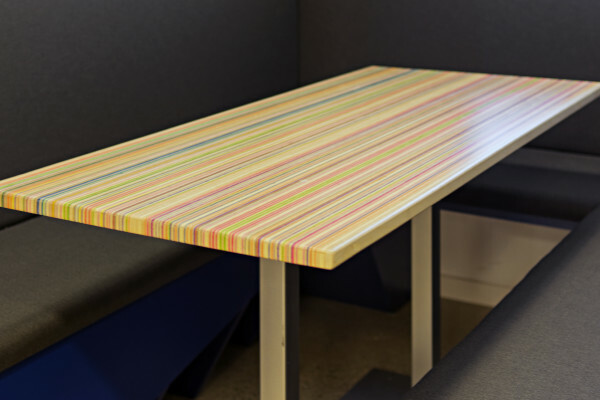 This – over 3 meter long and 1,2 meter wide – tabletop is our first DecksTop with round edges. 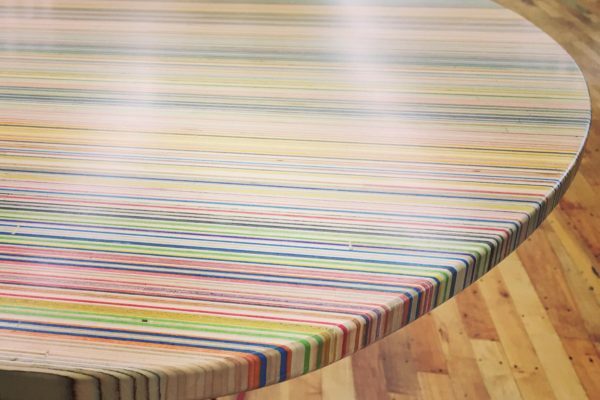 It took 240 recycled skateboards to construct this beauty. 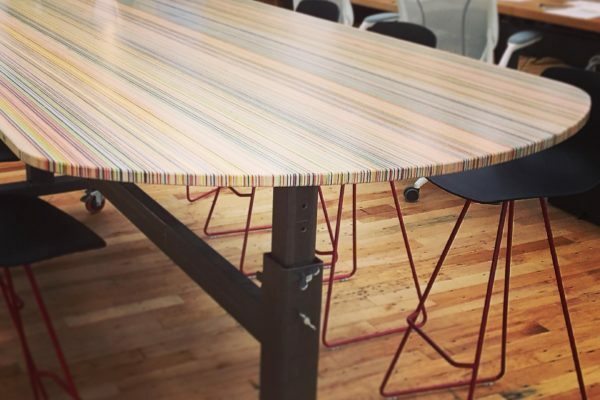 For a project of Pliskin Architecture NYC, Focused constructed two customized table-tops. 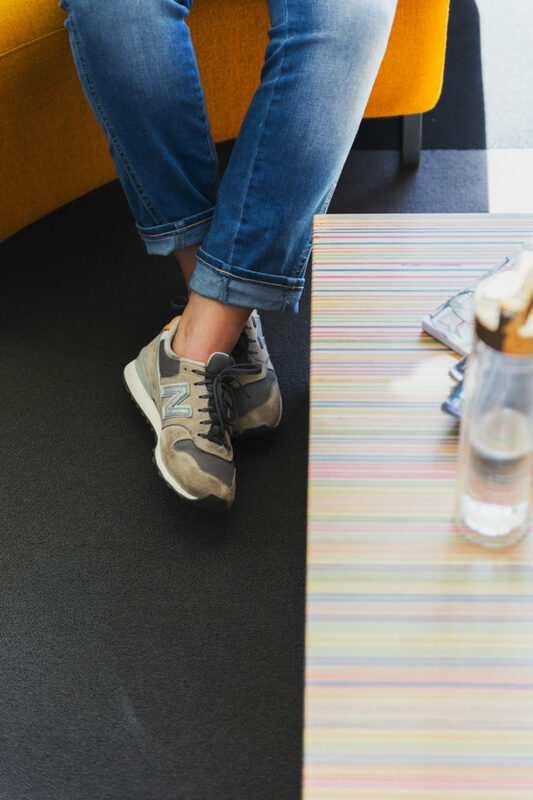 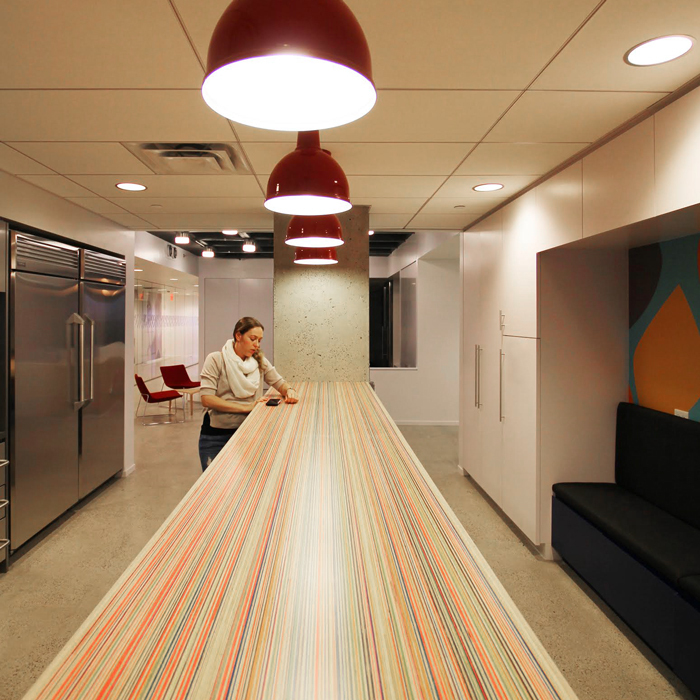 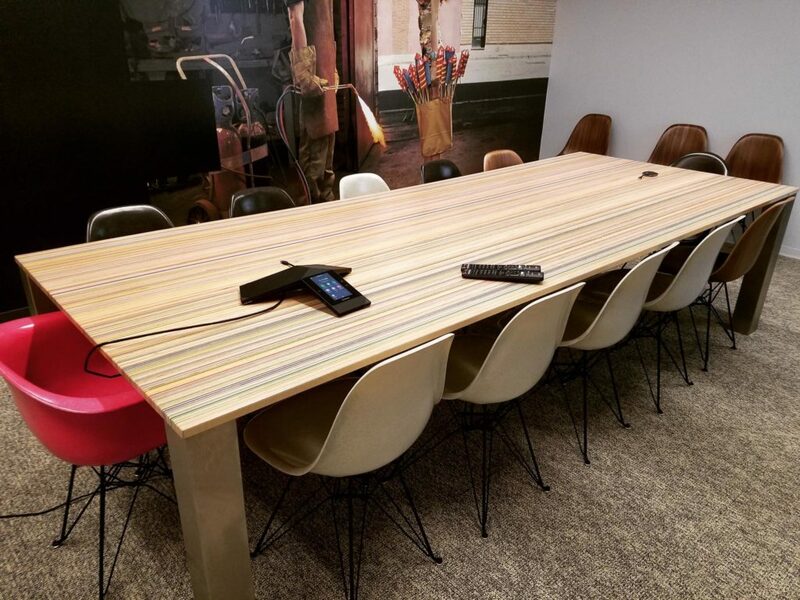 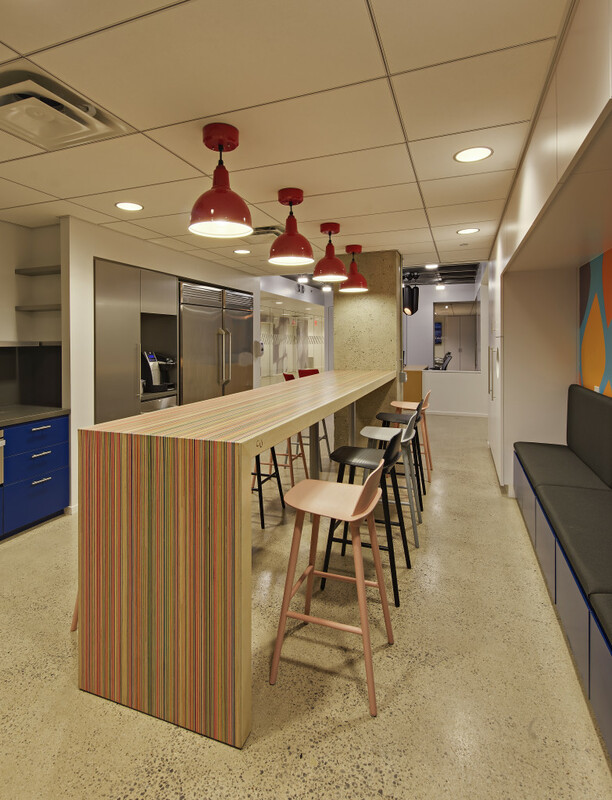 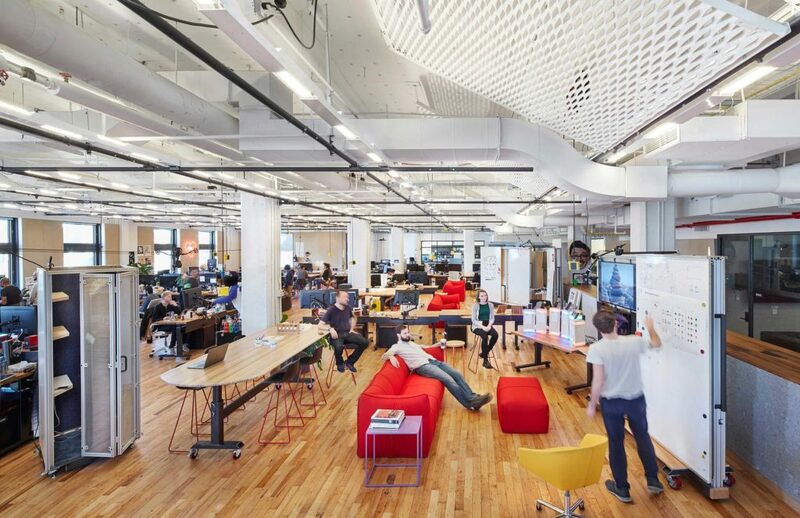 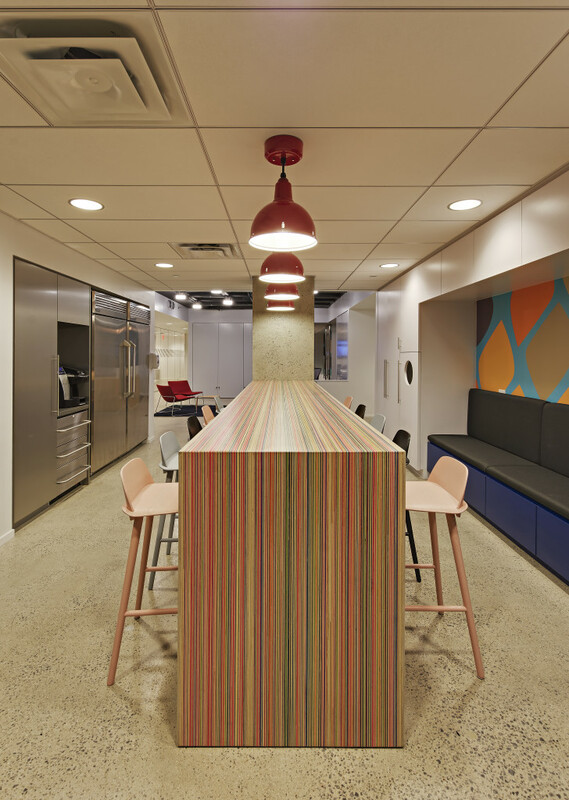 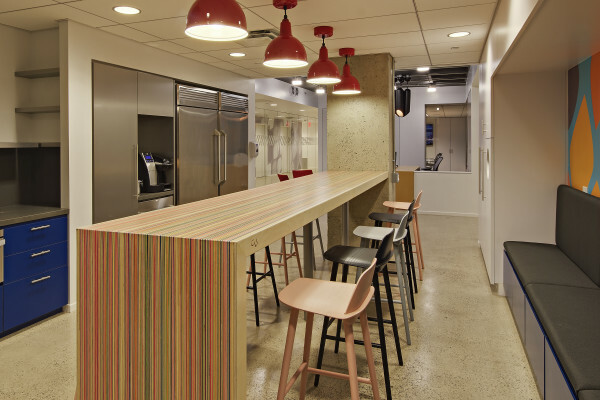 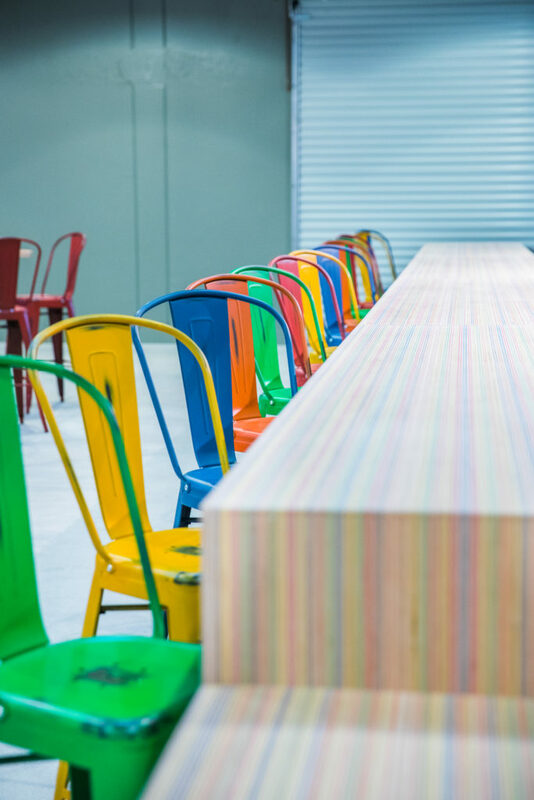 The tables where placed in the pantry of a global headquarters of a large tech company in New York City. 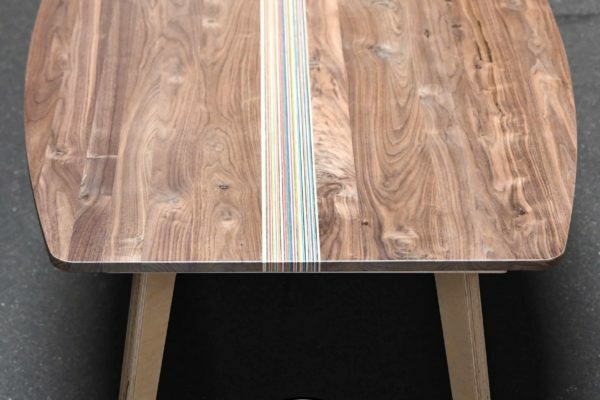 The showpiece is the long parsons table with a side panel. 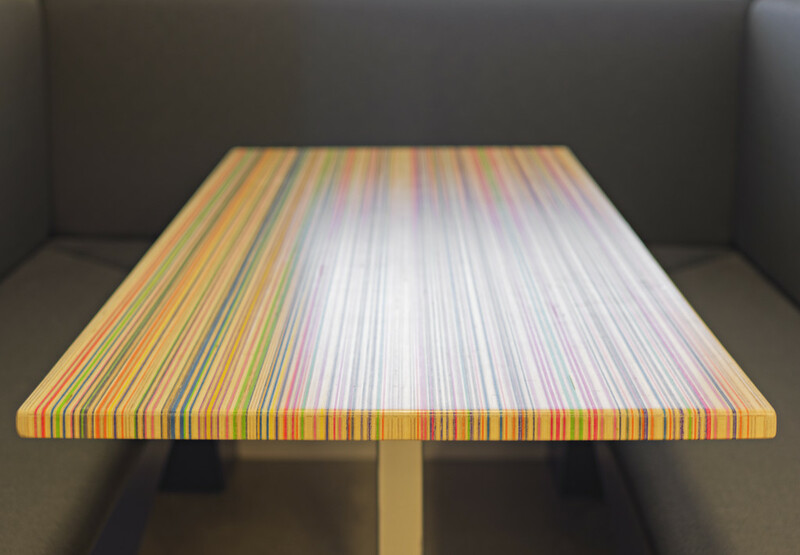 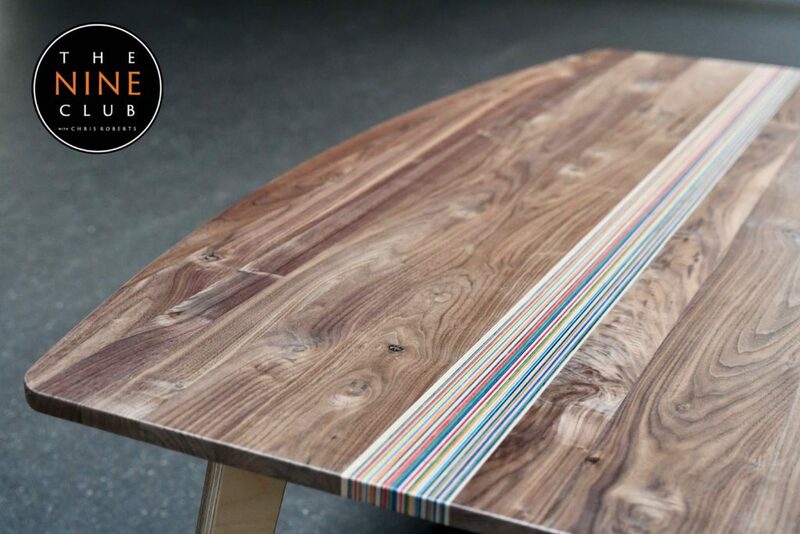 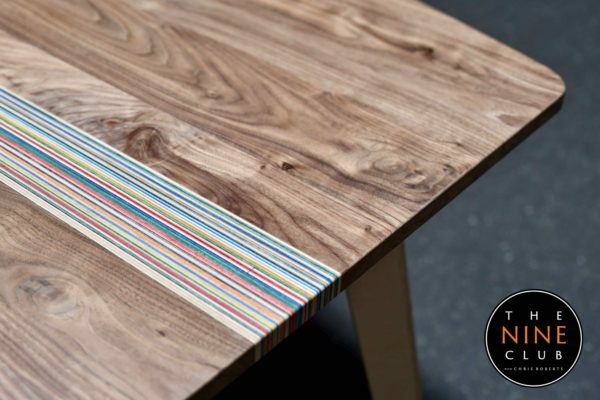 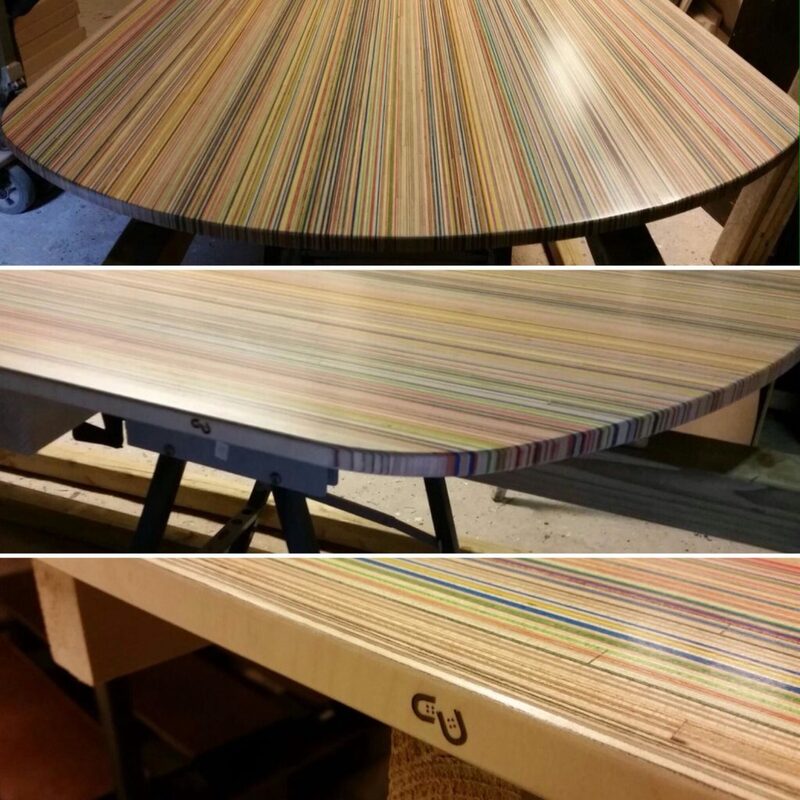 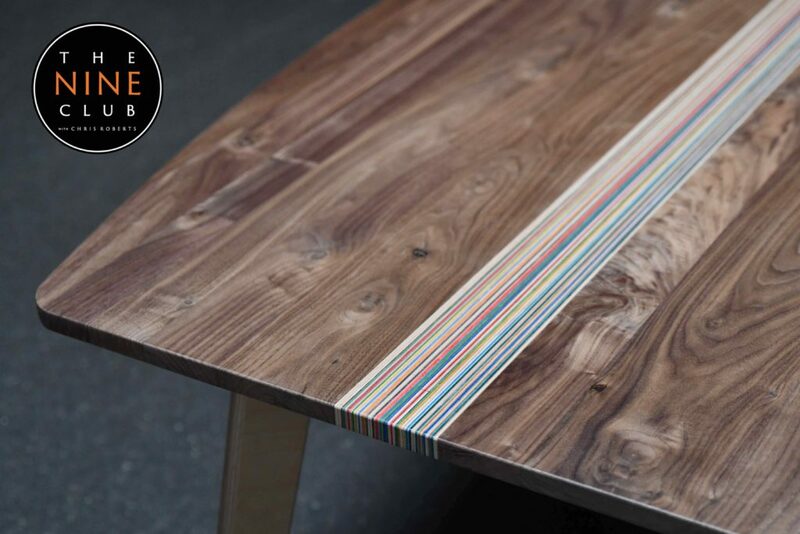 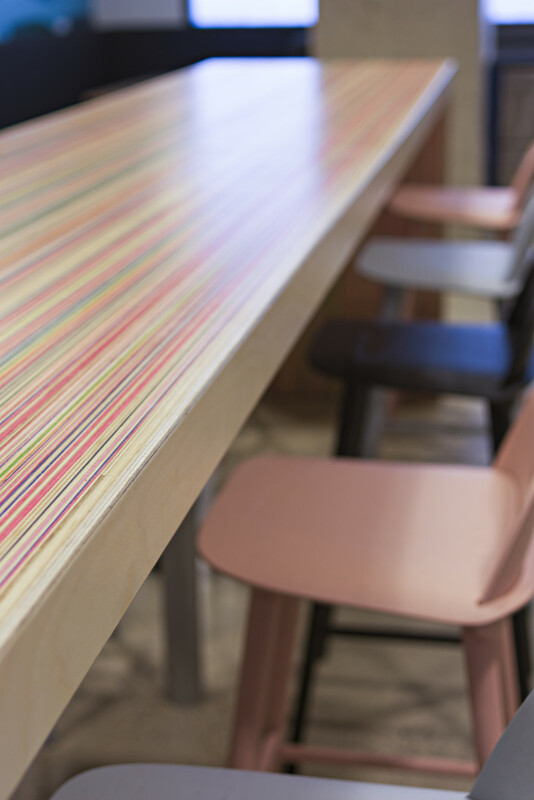 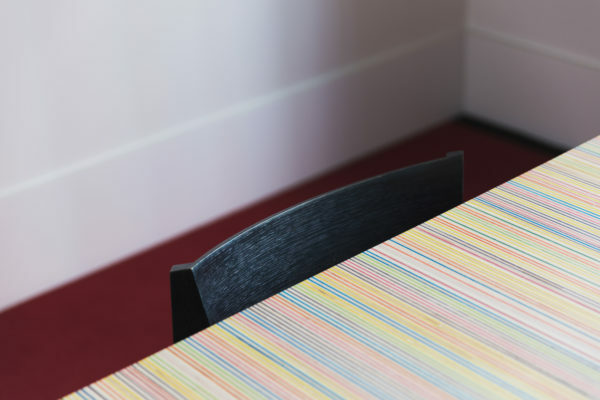 The lines of the top of this table continue into the side panel, resulting in a colorful waterfall. 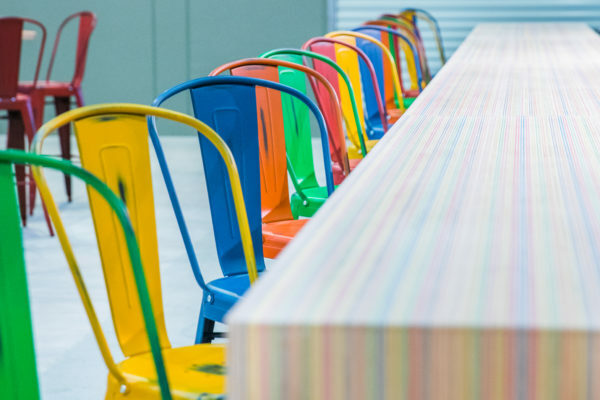 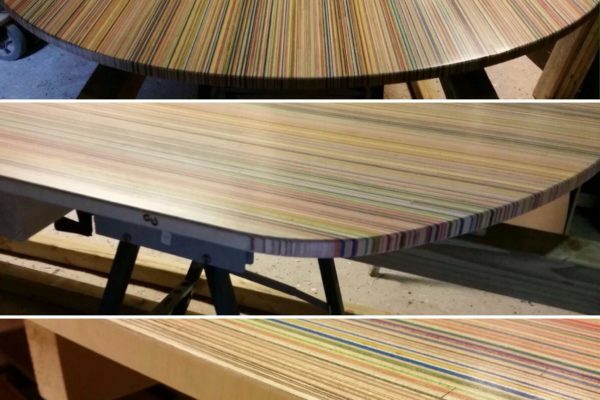 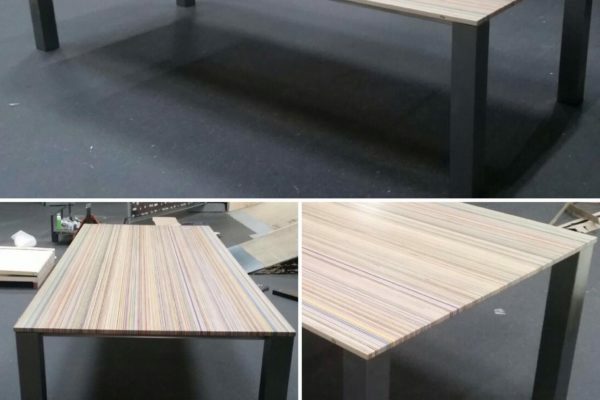 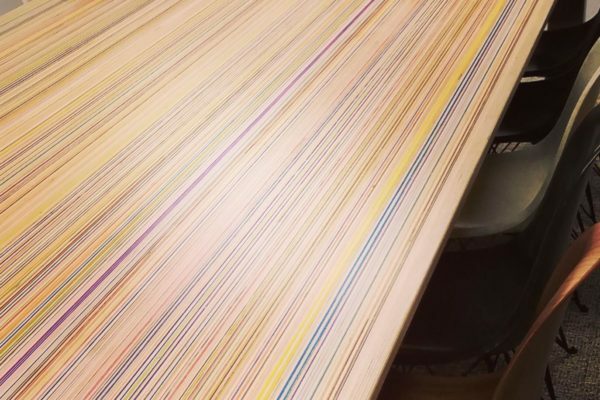 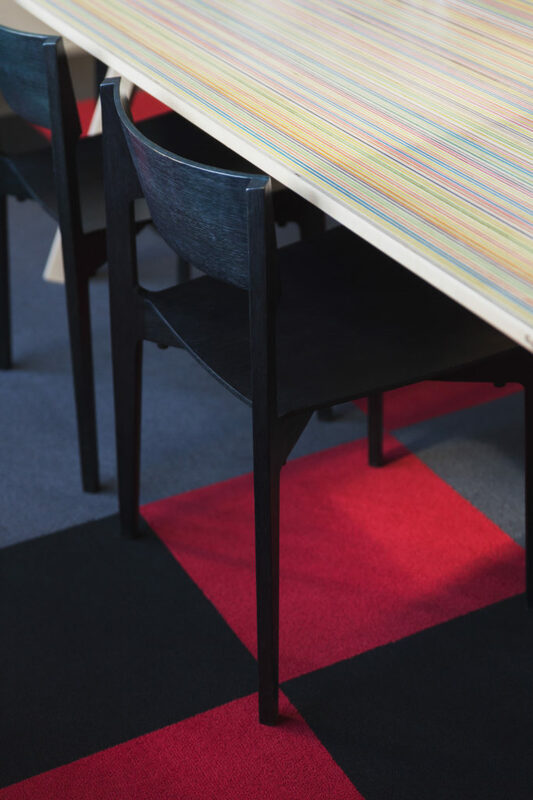 With its over 3,8 meters long lenght, this table is the largest table that has ever been constructed from recycled skateboards. 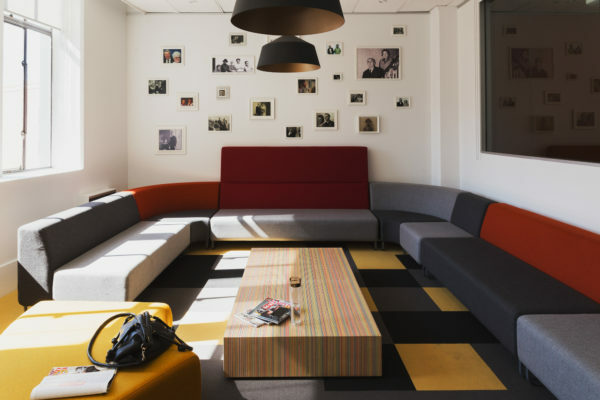 Together with the matching smaller banquette table it forms a unique piece in the center of the new community on the floor. 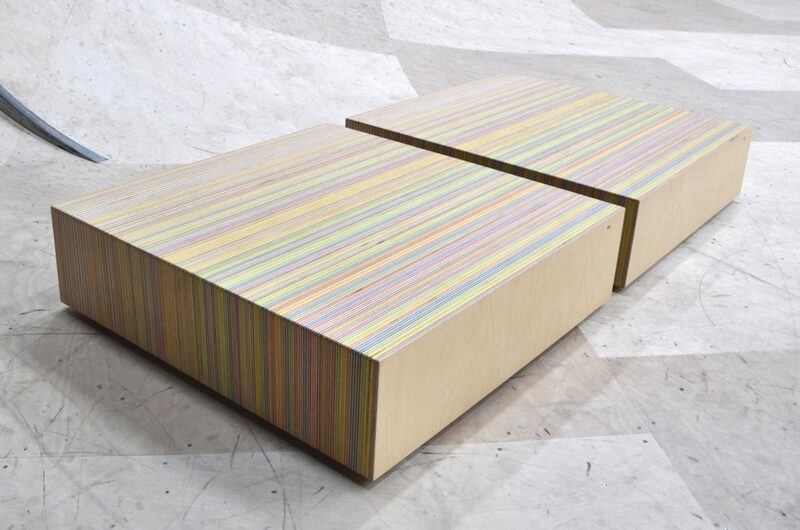 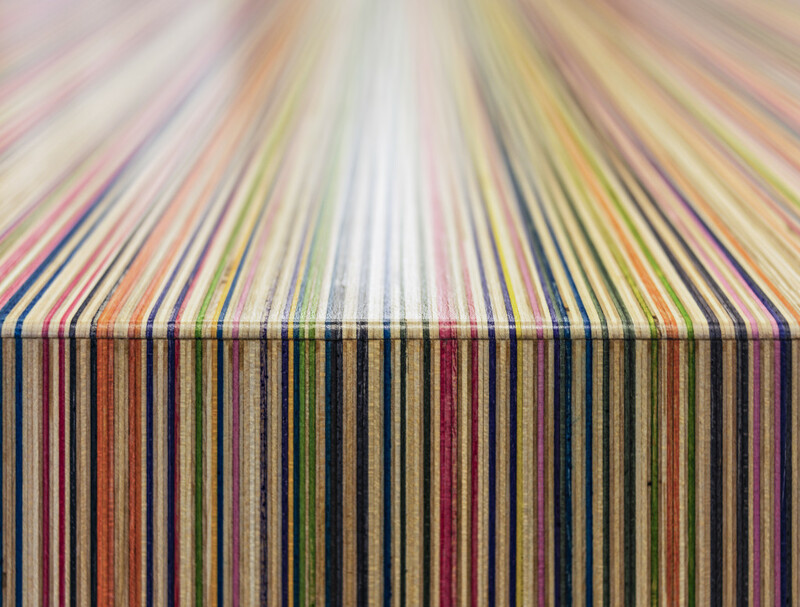 A total number of 110 worn-out skateboard decks have been recycled into these two pieces. 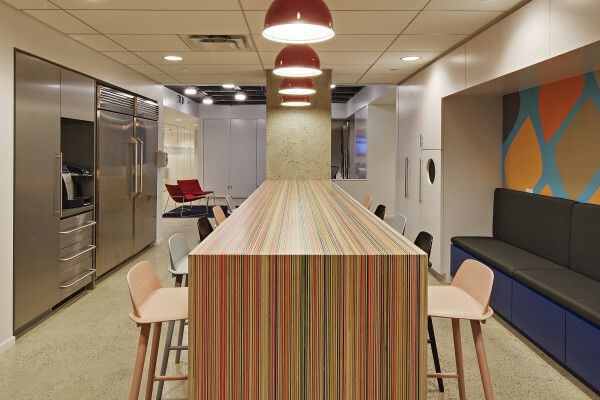 More information about the Pliskin Architecture NYC project can be found on their website. 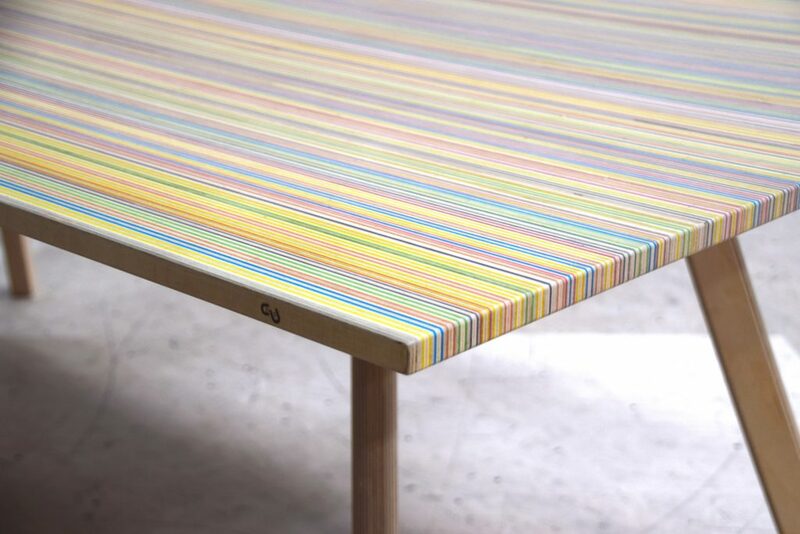 This project was featured on Designboom, Creators (VICE) and Wescover. 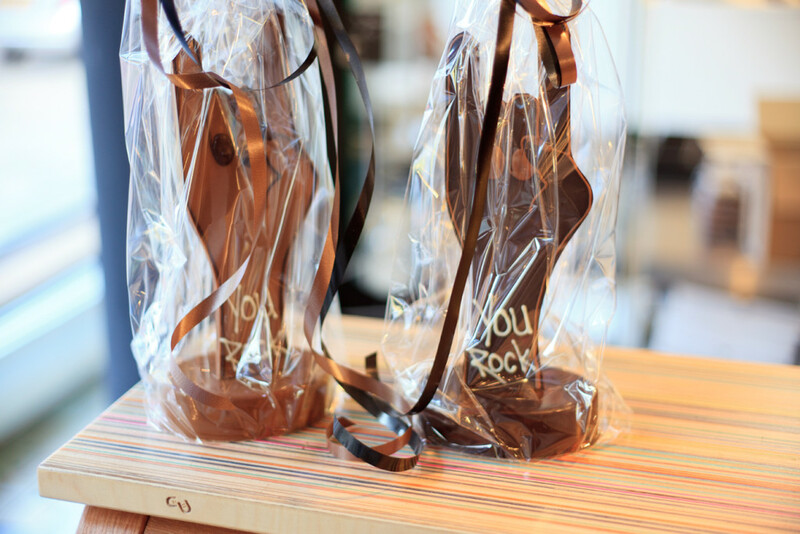 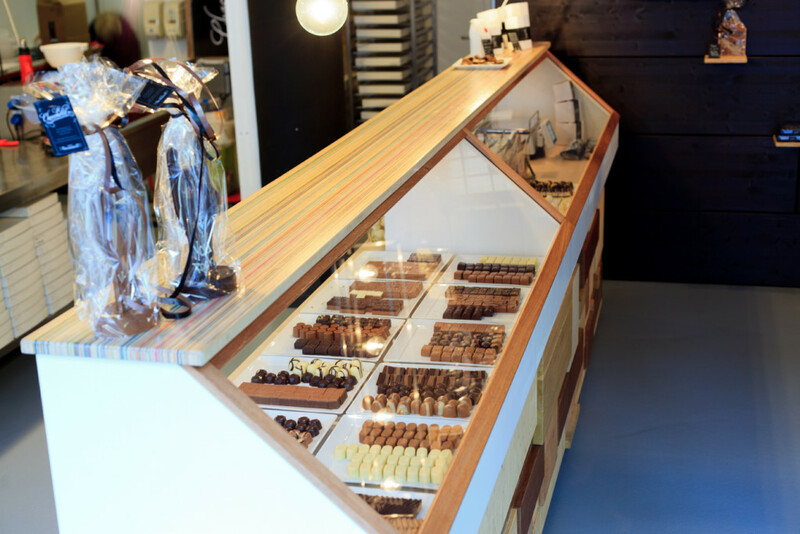 The popular chocolate store Chocoholic in Rotterdam has been redocorating this year. 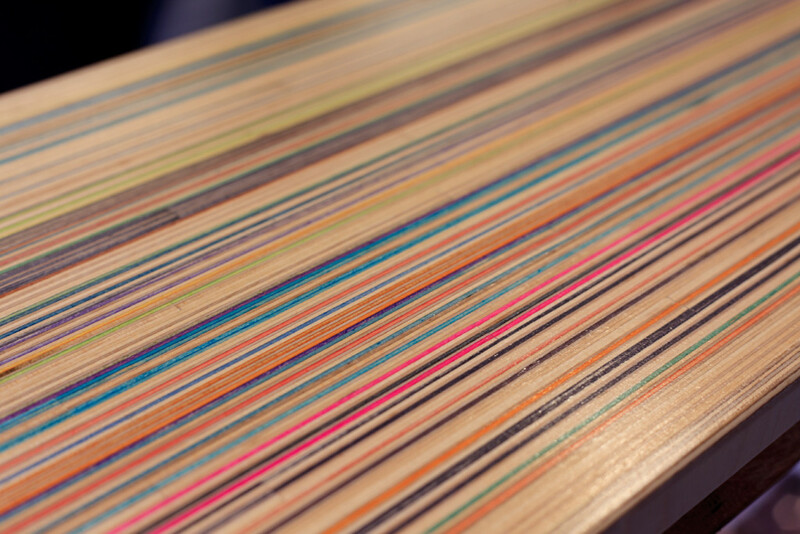 One of the new items in the store was a counter with an custom built DecksTop™ by Focused on top. 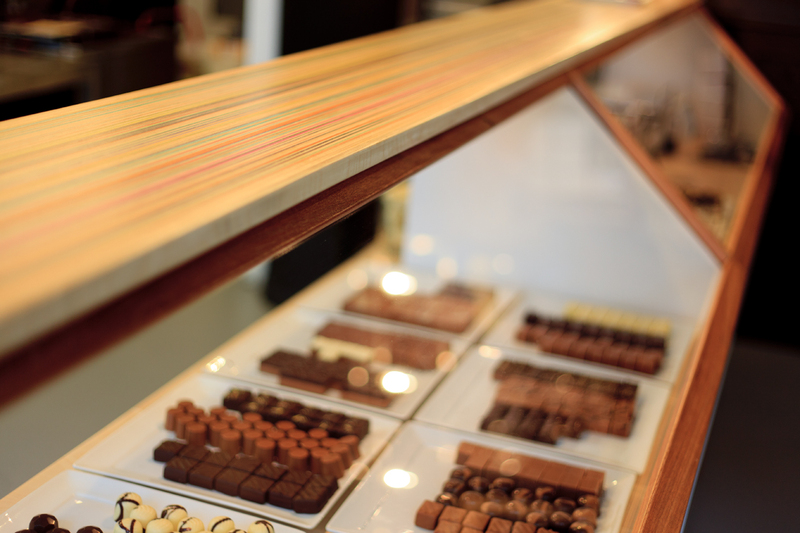 Shop owner Marco Harreman is not only passionate about chocolate, but also about sevenply maple which he used to ride back in the days. 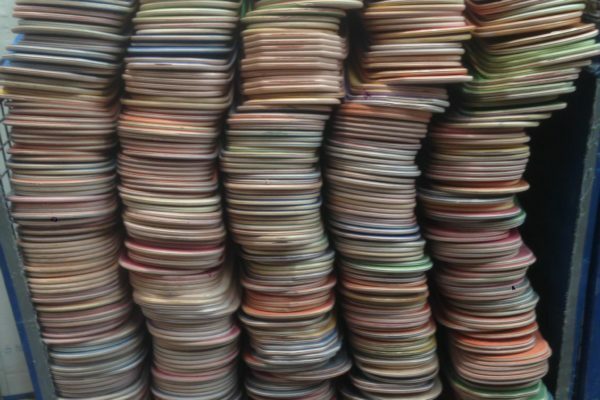 We integrated four of his old rides in this custom built DecksTop™. 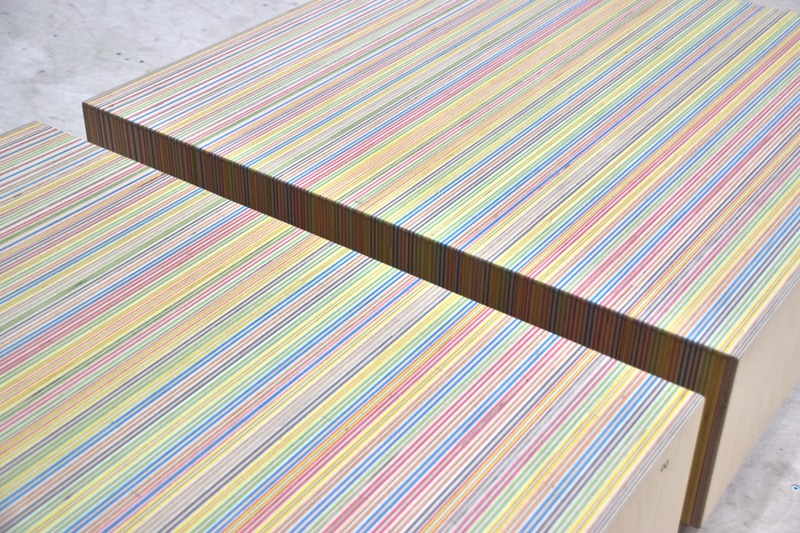 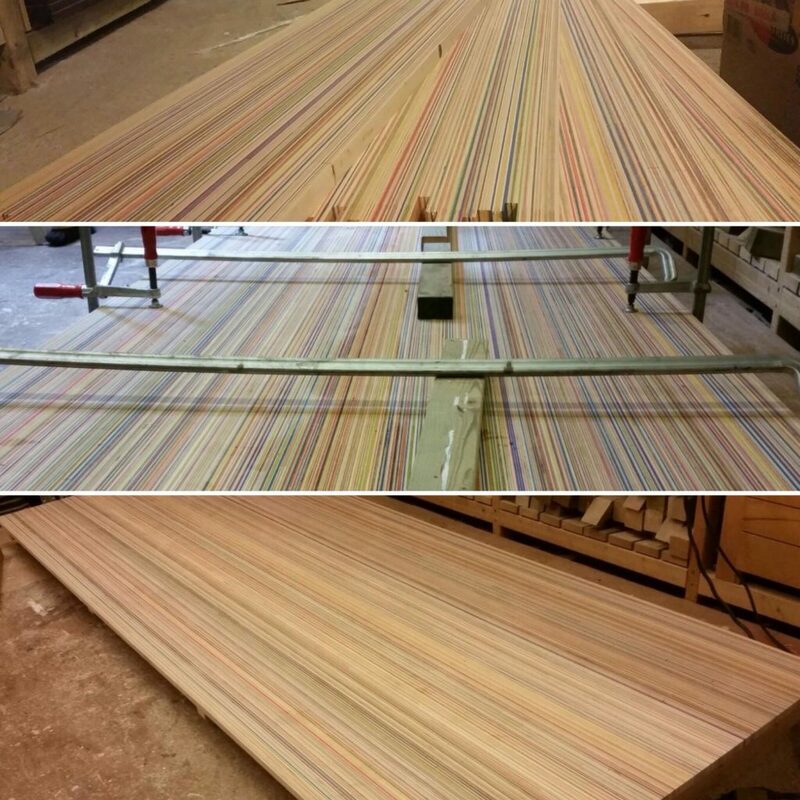 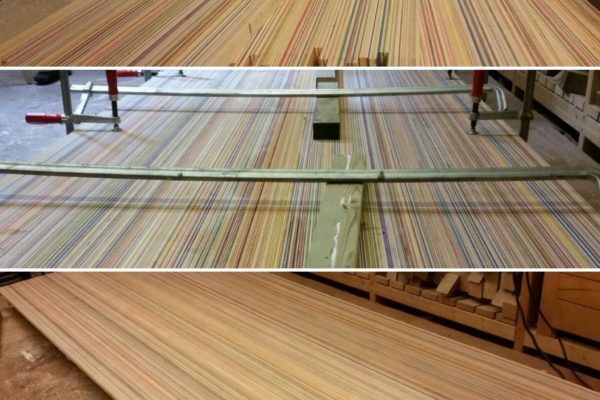 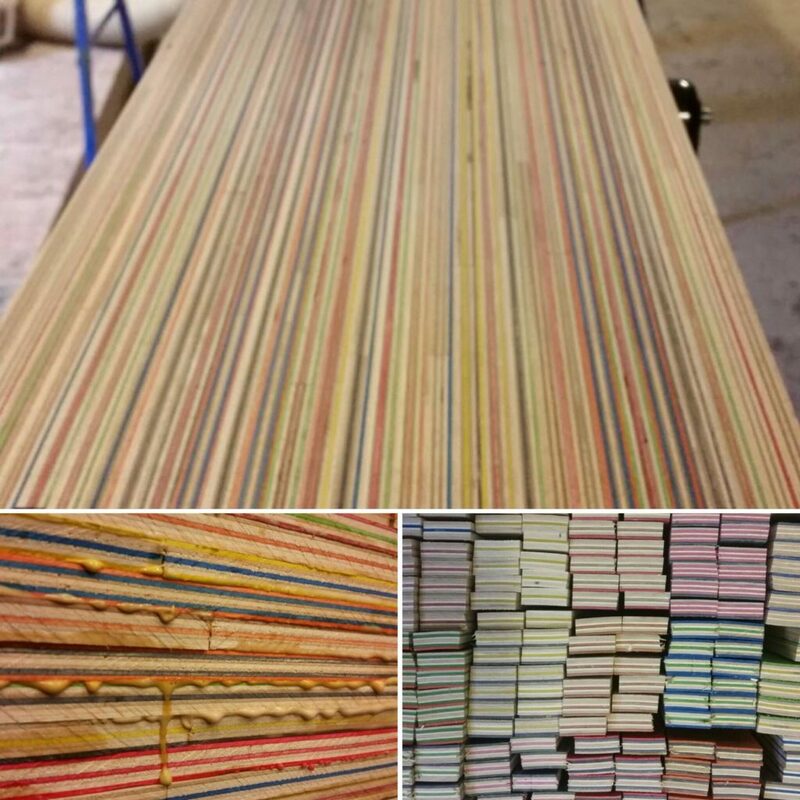 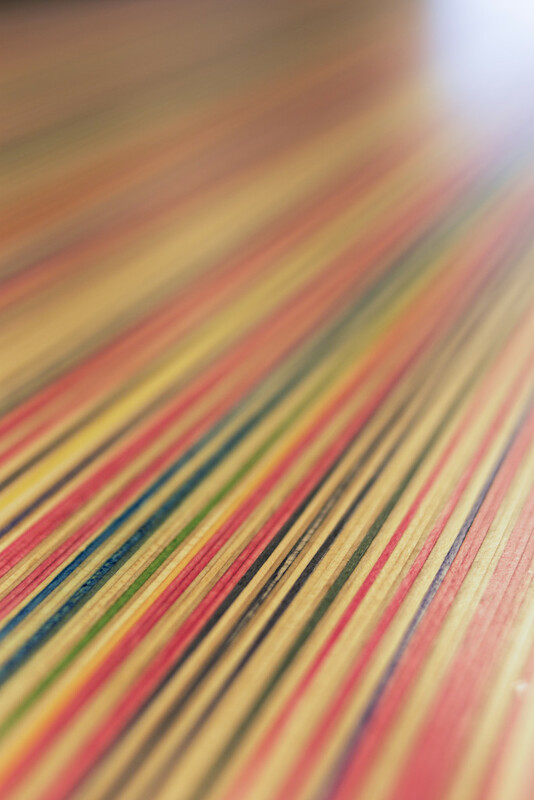 It took 29 skateboard decks to build this – more than 4 meters long – piece. 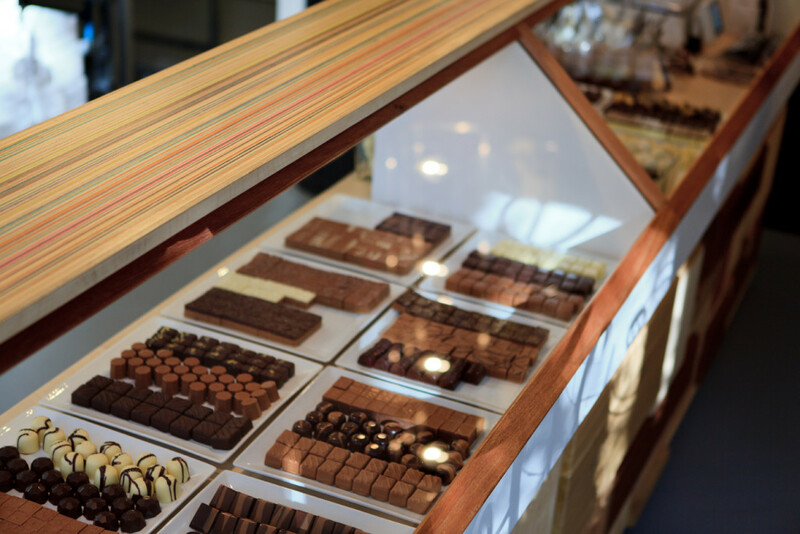 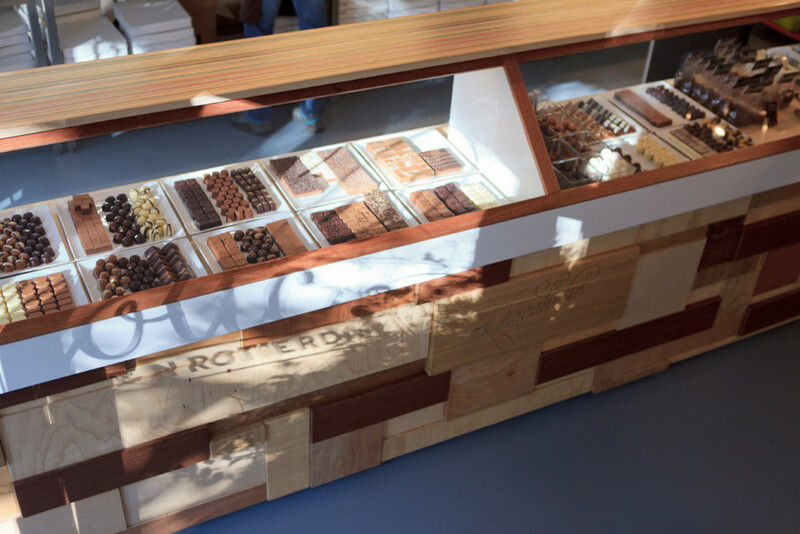 The new Chocoholic counter was designed by Jeroen Dekker and developped in collabaration with Hectik Skateramps. 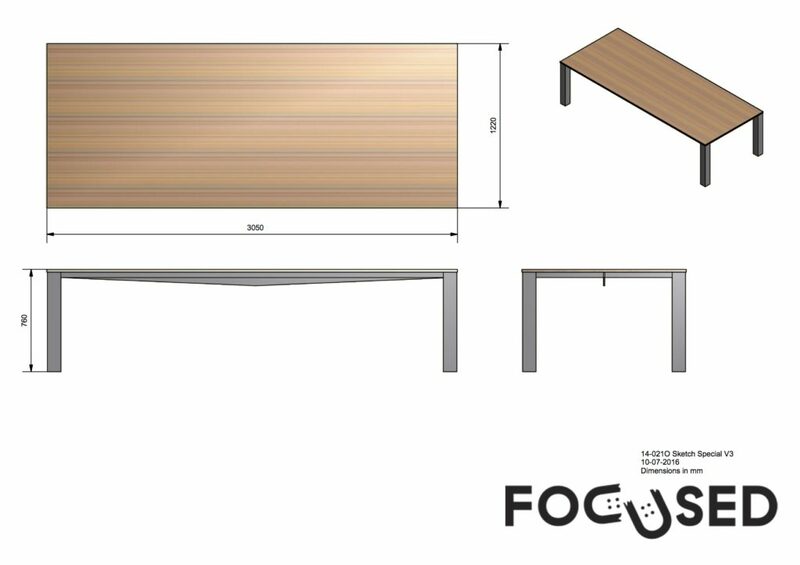 For information about custom built tables, please contact us at info@focused.nu.